Late post tonight–I was screwing around looking at pictures I took during the Centennial and I lost track of time. Rustling through the photo files this afternoon looking for military related images, I hit the jackpot with these. They are all labeled “NROTC unit review, 1961/62 school year” but one of them is remarkable not for its subject but for the background. That’s a pretty new President Pitzer standing by the microphone. Zoom in on it and look at the tiny little trees! Bonus Second Surprise: It was noted on the backs of all these pictures that they had been donated to the Woodson by Col. Jack Knocke. 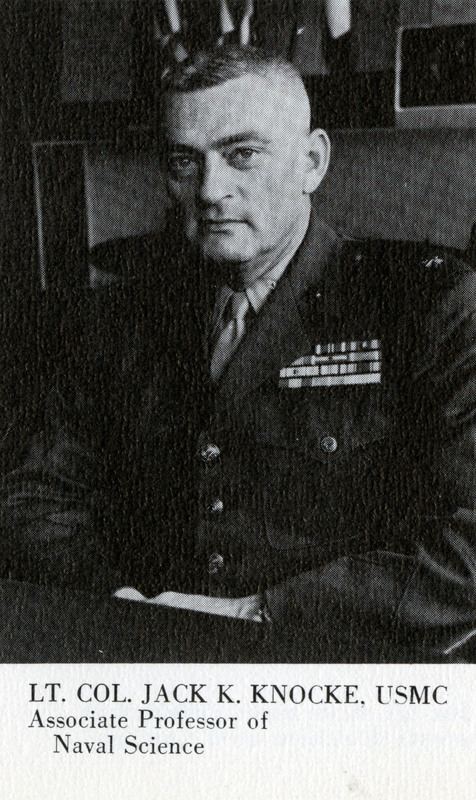 Knocke served in the Marine Corps for over thirty years and saw combat in World War II, the Korean War and Viet Nam, winning a Distinguished Flying Cross, a Bronze Star and two Air Medals in the process. 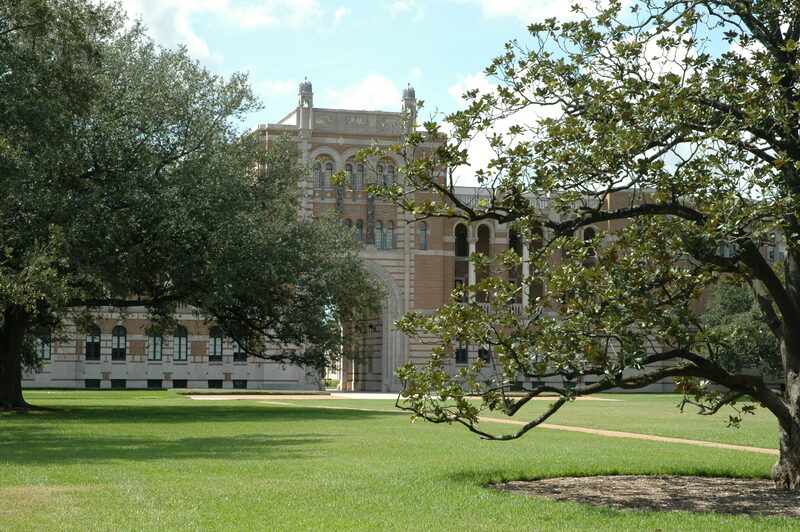 A bit of digging turns up the fact that he taught Naval Science at Rice from 1960 to 1963. One suspects he would have snorted at grade inflation. Thanks for posting these, Melissa. 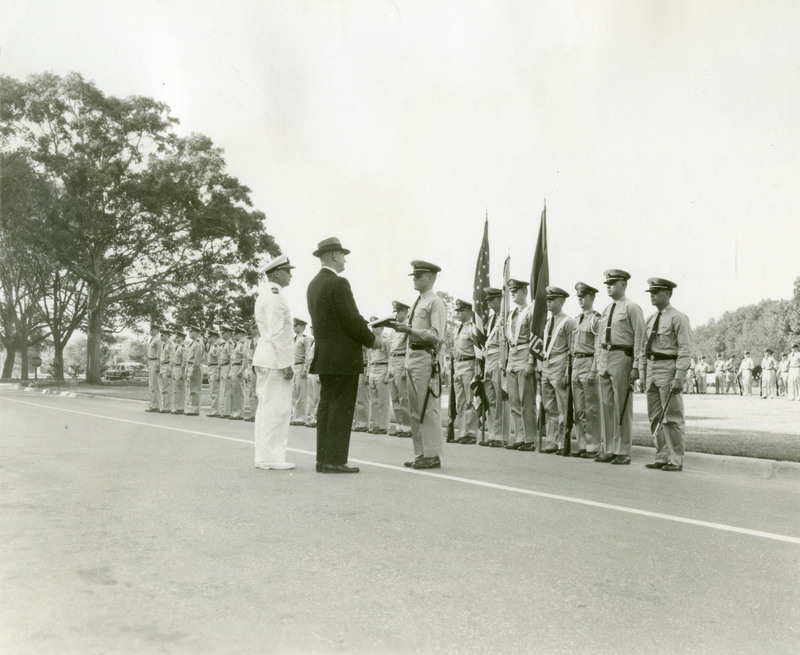 It looks to me like the men in long ties and lighter colored caps are Navy cadets and the men with the ties tucked in and dark caps (and epaulets on their shirts) are Army or Air Force cadets. Tucking the tie into the shirt was a very Army-associated look. The officers seated on the dais, except for the Navy officers in service dress white, look to be wearing Army or Air Force uniforms and caps, not USMC. Now that I think about it it makes sense, because there was Army ROTC here (Department of Military Science) until, oh, 1995 or so? Another interesting detail is that this is during the DoD “simplification” period when the Army switched to black accessories like ties, belts and shoes (late 1950s) instead of khaki and russet. And the Navy went to black belts with khaki, instead of khaki webbing as worn today. It’s a little strange to see the dark hats and belts with khaki. If this picture was taken today, the Navy guys would probably be in their white short sleeve uniforms and the Army guys would be in white shirts and ties with dark blue pants with a gold stripe. Just went back and looked in the ’61/62 General Announcements. There was Army ROTC (Military Science) and it was centered around the Corps of Engineers at that time. Similar photos are on page 286 of the ’62 Campanile. 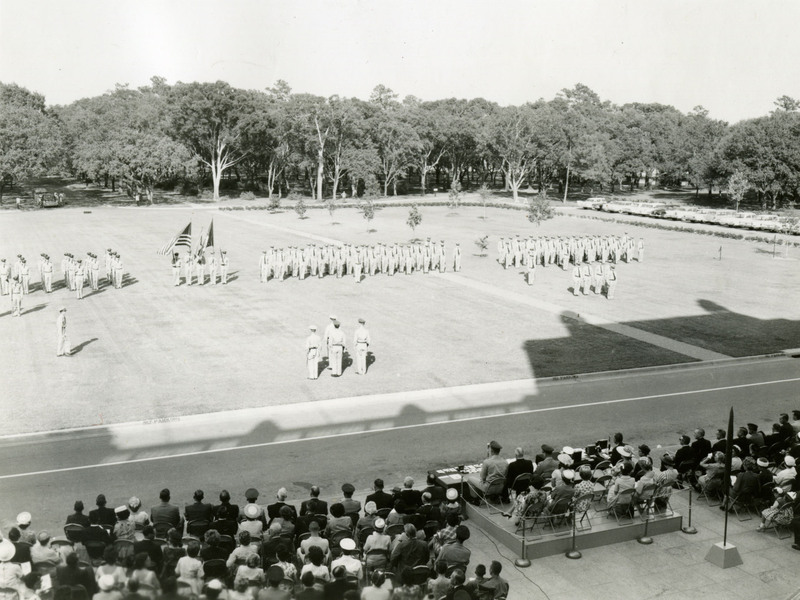 I should be able to identify most of the cadets in the first photo, but memory fails. 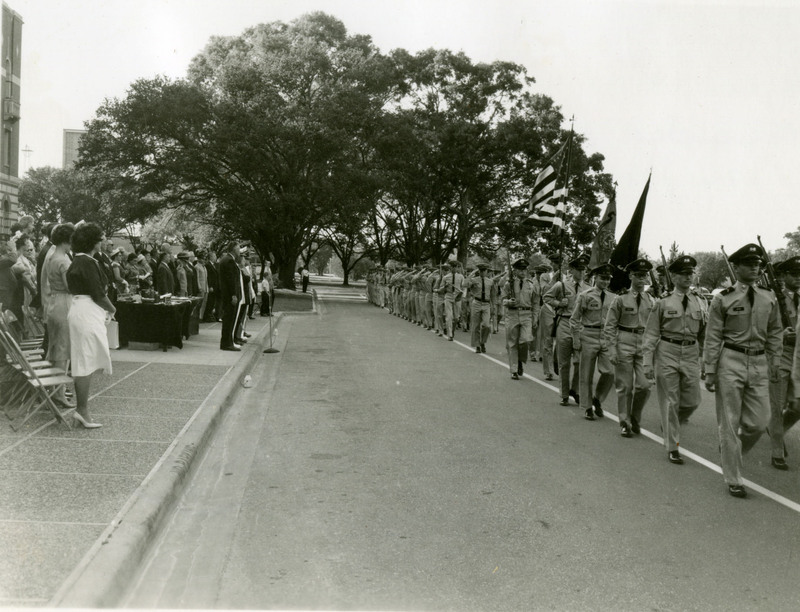 I know for certain that the sixth cadet from the right (with the U.S. flag) is the late John Mundis WRC ’62. Robert Johnston should be in here somewhere, and he should be easy to spot because of his size. He may be at the far left, partially visible.